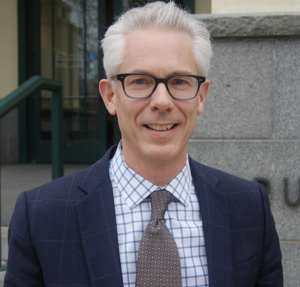 GREENWICH, CT – The Bruce Museum today announced that its Board of Trustees has appointed Robert Wolterstorff as The Susan E. Lynch Executive Director and Chief Executive Officer. Wolterstorff has served as Executive Director of the Bennington Museum in Vermont since 2012, leading the 167-year-old museum through a well-received curatorial makeover. In addition to overseeing improvements to its gallery spaces and innovative re-installations drawing from the museum’s collection of 40,000 objects, Wolterstorff spearheaded a series of changing exhibitions that resonated with museum members and attracted new audiences. The 2016 exhibition, Milton Avery’s Vermont, increased attendance by more than 40 percent, growth that was surpassed in 2017 with Grandma Moses: American Modern. Positive reviews and strong attendance continued in 2018 with Thinking About Extinction and Other Droll Things: Recent Prints and Drawings by Edward Koren, an exhibition in the museum’s Works on Paper gallery featuring The New Yorker cartoonist, who resides in Vermont. Wolterstorff deepened the Museum’s involvement in 20th-century art by creating a new Bennington Modernism Gallery to highlight the achievements of the circle of now-famous abstract painters and sculptors associated with Bennington in the 1960s: Helen Frankenthaler, Kenneth Noland, Jules Olitski, Larry Poons, David Smith, Tony Smith, and Sir Anthony Caro. Two things Wolterstorff is most proud of during his tenure as Executive Director are the exhibition 3D Digital: Here and Now, which focused on the innovative digital manufacturing in Bennington, and a recurring series of one-night living tattoo exhibitions, which has brought new audiences to the museum. An architectural historian with a passion for contemporary art and Victorian design, Wolterstorff previously served as Director of the Ebenezer Maxwell Mansion in Philadelphia. As Executive Director of Victoria Mansion in Portland, Maine, from 1998 to 2010, Wolterstorff secured key grants for architectural preservation, forged strong relationships with major donors, and completed two capital campaigns for improvements to the National Historic Landmark. The Campaign for the New Bruce will more than double the size of the Museum, from 30,000 square feet to 70,000 square feet, adding education and community spaces and significantly expanding its space for permanent and temporary installations of art, science, and natural history exhibitions. The centerpiece of the New Bruce is a three-story addition to be integrated with the current structure. Designed by the New Orleans firm of Eskew + Dumez + Ripple, the building will open to Bruce Park and feature a façade of cast stone and glass inspired by the striated walls of Connecticut’s historic rock quarries. The New Bruce project – the first since a $4.3 million expansion in 1992 ­– began with the expansion of and improvement to the Museum’s parking lot in the fall of 2018. The next phase of construction is expected to proceed in the fall of 2019 with the renovation of the current changing gallery spaces. Wolterstorff earned a master of fine arts and a doctorate in art history from Princeton University, where he wrote his dissertation on the 18th-century neoclassical architect Robert Adam. He has a master’s in art history from Williams College and a bachelor's in biology from Calvin College in Grand Rapids, Michigan. Over a 27-year career in the arts and museum leadership, Wolterstorff has also held curatorial and research positions at the Philadelphia Museum of Art, the Clark Art Institute, the Williams College Museum of Art, and the college's Chapin Rare Book Library. He served as a trustee for the New England Museum Association from 2006 to 2015 and is currently on the board of the Williamstown Art Conservation Center. Wolterstorff and his wife, Mari Jones, have two children, a son in college and a daughter in high school.